Please and thank you are the most important foreign language words to learn when traveling; crucial for civil discourse. But there’s one word we did not expect to need to know: Rechnung. In Germany last summer, most service employees at restaurants and cafes helped us with their excellent command of English. But still we practiced utilizing words from a travel-guide phrase chapter, with no prior training except for my DH who took a couple years of German in high school more than 20 years ago. When our beverages, and again when our food arrived, we’d each respond, “danke” (thank you, pronounced dank-uh), with a smile. We found that eating at a restaurant or cafe in Germany is a fairly relaxed occasion. Waitpersons expect you to enjoy a meal slowly, talking and enjoying the company of your tablemates, lingering over the last drops in your glass. It was as if the table was ours for the evening and into the night. That would be wonderful if I were out for the evening with friends or my DH. With kids, though, even with kids who can behave nicely in restaurants, the experience should be done in an hour and a half, max. Over and over, whether at a German-fare restaurant in Munich, or an Italian cafe in Berlin, we’d all finish our meal, then wait and wait and wait to even catch a glimpse of our waitperson. It seemed standard practice for waitpersons to serve the food, then leave the patrons alone. But anyone with kids knows — you’ve got to get them moving again. For most of our restaurant meals in the US, we are accustomed to the waitperson checking on us at least twice during a meal, and inquiring if we’d like dessert while promptly clearing the empty entree plates. A bill is quickly but discreetly placed on the table after we decline or order dessert. The departure time is up to us, but all the necessary components are provided. At the end of a restaurant meal in Germany, our kids, then 9 and 13, would start to get bored and then restless, then start annoying each other and us out of frustration. More than once I exited the restaurant with the kids or had them pull out their Nintendo DS games. Both options included waiting for my DH to spy the waitperson, or even search for our waitperson, to get the bill to pay so we could leave. Thank goodness ‘the bill, please?’ was in our phrase book! When we return, we’ll remember to request the bill when the food arrives. Unless, of course, the kids aren’t present, in which case I’ll relish a lovely outdoor table for two and savor a slow, pleasant meal with my DH. 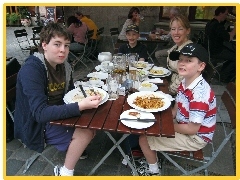 Click here to see Munich hotels for Family of 5 or 6. See the menu above for large family hotel lists in Berlin, Copenhagen, and other European destinations.